Rate this Article Duelyst is a free to play tactical card game that some players might find it a bit difficult to learn. Well, fear not! We've come up with a simple guide that will teach you the basics along with a couple of beginner's tips. 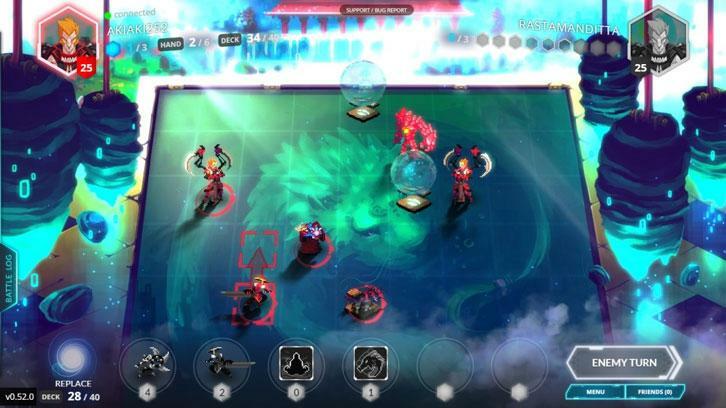 Duelyst is a free to play tactical card game that is easy to pick up but players will soon find themselves thinking about critical decisions that will eventually lead them to victory or defeat. Players will need to take turns in controlling their units, and there are different moves that a player may take. Players may even find themselves thinking multiple steps ahead to best out their foes. This will be a simple guide to cover the basics. Players will start off with starter decks from six different factions or once they have obtained enough cards, they may even start building decks of their own. Battles are done on a five-by-nine board where units can be deployed. Players will start off with their General which would have 2 points of damage and 25 points of health. Battles are won by eliminating the opponent’s General. Mana will be needed to use cards, and mana will be obtained passively every turn and players will also gain an extra 1 point of mana by capturing mana springs. Players would need to start playing against computer controlled opponents to unlock a faction and as well obtain cards from that faction. Cards can also be obtained by gaining levels for a particular faction by playing games using a particular faction and as well as from Spirit orbs obtained using gold or via real money. Once you are confident enough and have gotten the grasp of the game, you can go ahead and play against other players in ladder matches. The game’s mechanics are pretty simple to learn but will be hard to master as there would be different moves that you can take per turn and a single mistake could even lead you to defeat. Bottom-line is you would need to take certain steps that could lead you to eliminating the opponent’s general. You will be given a limited time per turn to make your moves. You can either move your units into strategic locations to best out your opponent in succeeding turns or you may choose to summon more units or try to secure mana springs to gain extra mana to use for cards. Each card will have a different mana required for you to be able to use them and at the start of the match; you will be able to discard 2 cards to choose a more beneficial starting hand. The player on the left side of the map will be the one who can make a move first and each player will have 2 mana points in the beginning of the game, so low cost cards may be a better starting hand. Players will need to decide which moves to take and which cards to play per turn and it seems to be more beneficial to use all the mana points that they have as unused mana will just be forfeited in the next turn. Players will be getting increasing mana pool as the game progresses; so, players will start at 2 mana points and then 3 mana points on the next turn and so on. Now, each faction will have different mechanics and you will need to familiarize with each of them to decide which moves you will need to take per turn when playing a certain faction and as well as to know how to counter whatever your opponent is planning to do. And you would also need to learn which way to move as you will only be able to summon units 2 squares near any ally unit. And summoned units will be exhausted when summoned, so they can only move or attack on the next turn. There are a lot of mechanics in the game and for the basics; you would only need to learn a few to get a hang of the game but you will surely learn more as you play more. The first thing to do is to hover over your cards and see what they can do and if they have additional effects which may help you create a certain combos and other strategic techniques which will help you best out your enemy. You can use flying units in secure a spot in map as they will be able to move anywhere in the map. For example, you may want to place them near your enemy so you can summon a hard-hitting unit near your enemy. You can even airdrop units to summon them anywhere in the map even without being near an allied unit. And units with rush can move or attack as soon as they are summoned. You can use units with opening gambit to make impressive combos or make use of special effects such as heals and buffs. Most units can only target single units but units with frenzy can damage all units adjacent of their targets. And you can even utilize ranged units to attack units from a distance without any risk of a counter-attack as units in this game will be able to counter-attack when targeted even when they have zero HP after receiving damage but will still die after making a counter-attack. There are tons of mechanics and techniques to learn in Duelyst. It may certainly be easy to learn but with the high skill cap, it may take time to master. Just take time to practice and familiarize each faction and get acquainted with their cards and soon you will be unlocking more cards and build decks and strategies of your own.